It’s the middle of November and for the first time since mid-October there is bright, glorious sun, and I am dying to get in a rare off season outdoor ride. Mere moments ago I was excited at the thought of bundling up to brave the chilly air, and to bask in the glory of a sunny Sunday afternoon, yet now with a black film of grease caked onto my hands, sweat dripping from my brow and profanity flying from my mouth, I am feeling disappointed, angry and frustrated. After taking my rear wheel off and swapping my indoor trainer tire for my road tire, I am struggling to get it back into place. A task that should be simple and routine, yet I have made it quite complicated; typical. By the time I have the wheel back in, the brakes seem to have magically shifted and now I’m fiddling with screws that connect to components which are foreign to my pea sized brain’s understanding of bicycle mechanics. At this point, I have made too much of a mess, and I worry that by fiddling with unknown parts, I have increased my odds of mechanical failure on what was supposed to be a lovely Sunday ride. With the bike shops closed today, I am left with the decision to degrease my hands and pout. I have said it so many times before, and I will say it again and again, there is so much to learn. 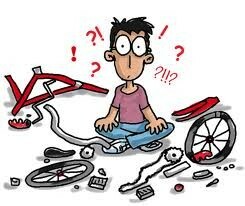 The mechanics and maintenance of my bike is something I really struggle to understand. I remember as a kid that if my chain came off I walked that bike back to wherever I came from, because I simply did not know what to do. When I first started this sport, I didn’t even know how to change a tire or grease a chain, and I really still struggle with both. Today’s rage against the bicycle episode, and there have been a few, really highlights the need to truly understand all aspects of this sport, including the equipment. So it’s off to the bookstore with my dirty, greased up hands for a much need self-help book and then to the spin bike for a much deserved stare-at-the-wall-and-pedal sweat fest. I am overjoyed.